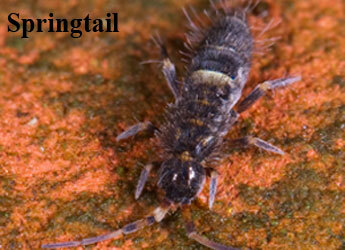 Front Range Pest Control of Fort Collins has trained professional experts in pest control of all common pests in the home or any type of structure. We will formulate a plan to fit your needs, no matter what type of pest is infesting your space. Commons Insects that tend to be pests are Centipedes, Flies, Boxelder bugs, Crickets, Millipedes, Springtails and Sow Bugs. Many of these insects are harmless to humans, but they leave their excrement that may spread disease to humans. The Boxelder bug can be a very annoying bug to homeowners. It is actually known to be a nuisance more than a pest because the Boxelder bug does not harm things like other pests do. The Boxelder bug does not damage things within a home, does not bite people, and rarely damages things outdoors. The only slight damage that comes from having Boxelder bugs inside a home is that their excrement can leave a stain on items like carpet, draperies, and walls. Also, if a Boxelder bug were to be killed by being stepped on or crushed by something it would let out a foul smell. The Boxelder bug is also known as the stink bug due to the foul odor it releases if crushed. Centipedes are a gross thing to find in your house. Many times people find them near a water source, like a drain or a toilet. People usually assume that the centipede got there by crawling up through the drain pipe, but that actually is not true. Although centipedes do live in damp areas, they do not crawl around through pipes. The cluster fly is a nuisance pest for homeowners. It does not bite people, carry diseases, no cause any real damage to a home. Cluster flies are about five-sixteenths of an inch long; they are gray with golden-toned hairs on their thorax. Spotting them is easy because they are usually all clustered together on walls outside, sunning themselves. This is also where their name comes from, because when resting they usually will be clustered near each other. The cluster flies are similar to many other pests as they just want to get inside houses to stay warm. With this in mind, the winter time is when people will most often find cluster flies inside their homes. Front Range Pest Control of Fort Collins has trained professional experts in spider control and spider removal. Spider control is the solution to all spider problems. Spiders have venom used to immobilize their prey. 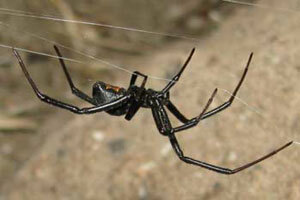 The Black Widow Spider, The Wolf Spider and seldom the Brown Recluse is found in Colorado and are dangerously venomous. Black Widow The female black widow spider has a shiny round, black body with a red hourglass shape on the underside of the abdomen. This shape can be broken or appear almost in spots. Sometimes there can be red markings on the top of the abdomen as well. The male is smaller and tan with a brown hourglass shape on the underside of the abdomen. The black widow's venom is a neurotoxin, which affects the nervous system and can be quite painful. Front Range Pest Control of Fort Collins 's Spider Control and Spider Removal Specialists are fully licensed and insured for your Peace of Mind. Brown Recluse - The brown recluse spider, sometimes called the "fiddleback" spider, is tan with a distinct black violin shape on the cephalothorax (head fused with the thorax or middle part). The brown recluse has six eyes, displayed in two rows of three on each side of the cephalothorax. This spider has a toxin that causes tissue around the bite to die. Left untreated, a brown recluse bite can lead to gangrene, amputation and even death. Brown recluse spiders are not common in Colorado, but they are found in the state on some occasions. They may have been brought here by trucks, trains, cars and people traveling in and out of the state. Wolf Spiders are robust and agile hunters with good eyesight. They live mostly solitary lives and hunt alone. Some are opportunistic wanderer hunters, pouncing upon prey as they find it or chasing it over short distances. Others lie in wait for passing prey, often from or near the mouth of a burrow. There are many genera of Wolf spider, ranging in body size from less than 1 to 30 millimetres (0.04 to 1.18 in). They have eight eyes arranged in three rows. The bottom row consists of four small eyes, the middle row has two very large eyes (which distinguishes them from the Pisauridae), and the top row has two medium-sized eyes. They depend on their eyesight, which is quite good, to hunt. Their sense of touch is also acute. Wolf spiders are unique in carrying their eggs along with them in a round silken globe, or egg sac, which they attach to the spinnerets at the end of their abdomen. The abdomen must be held in a raised position to keep the egg case from dragging on the ground, but they are still capable of hunting while so encumbered. Also unique to wolf spiders is their method of infant care. Immediately after the little spiders hatch and emerge from their protective silken case, they clamber up their mother's legs and all crowd onto her abdomen. Their eyes reflect light well, and one method of finding them is to hunt at night using a flashlight strapped to one's forehead so that the light from the flashlight is reflected from their eyes directly back toward its source. This is also especially helpful because the wolf spiders are nocturnal and will be out hunting for food, making it easier to find them. Because they depend on camouflage for protection, they do not have the flashy appearance of some other kinds of spiders. In general their coloration is appropriate to their favorite habitat. 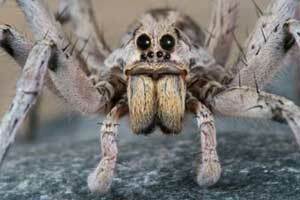 Wolf spiders will inject venom freely if continually provoked. Symptoms of their venomous bite include swelling, mild pain and itching. Though usually considered harmless to humans, the bite of some species may be painful. In the past, necrotic bites have been attributed to some South American species, but further investigation has indicated that those problems that did occur were probably actually due to bites by members of other genera. Australian wolf spiders have also been associated with necrotic wounds, but careful study has likewise shown them not to produce such results. Wolf spiders can be found in a wide range of habitats both coastal and inland. These include shrublands, woodland, wet coastal forest, alpine meadows, and suburban gardens. Spiderlings disperse aerially and consequently wolf spiders have wide distributions. Although some species have very specific microhabitat needs (such as stream-side gravel beds or montane herb-fields) most are wanderers without permanent homes. Some build burrows which can be opened or have a trapdoor. Arid zone species construct turrets or plug their holes with leaves and pebbles during the rainy season to protect themselves from flood waters. Give Front Range Pest Control of Fort Collins a call at (970) 203-1911 to get your Insect or Spider Problem under control!